I've written about Custom Training, the "sixth" SDL Tridion environment. But I almost forgot that I created a mock plan for such an environment as part of a course project before joining SDL back in 2010. See the document below for a modified submission for a Web Design class I took at University of Phoenix four years ago. We were encouraged to submit projects that reflected our jobs and this demonstrated things I knew (and didn't know) about Web development and SDL Tridion (R5.3 at the time). I got somethings right and others not quite right. I got some things right like project documentation basics including an informal project plan, problem statement, and objective. I had an informal concept of personas by describing developers and management as the "target audience" for this mock proposal. I included a content inventory of sorts under a section called pages and suggest separating design, content, and functionality concerns. There's both a simple wireframe and a sitemap documenting the example site and even some notes on accessiblity, copyright, and source control based on research projects and things I've learned as an "IT professional." I described "page types" without actually calling them page types. Four years later and it still looks like a typical wireframe. The example screenshots are a bit dated though. However, this proposal was not quite practical and missed some major points mainly with change management and content management changes. Though maybe not in scope for a "Web Design" course, there was no plan for change management and socializing such a project. Something like this would have needed to be built "for fun" or come with an executive project sponsor. This would have been a better fit as an open source project (four years later in 2014). I waved my hands (like a magician) by stating development would be informal and iterative (i.e. "agile" with a little "a"). But an actual Web Content Management system includes software updates and changing infrastructure in addition to code. A side-project sandbox wouldn't last long an enterprise setup if not widely known and actively supported by the entire team. As a fairly delivery or presentation server-centric proposal, this didn't confirm exactly where the corresponding publication would live in the BluePrint and in which environment. View the mock proposal on Google Drive or preview the embedded document below. Finally this isn't quite an SDL Tridion Functional Design, but it wasn't meant to be. Looking back I'm proud of what I did know, glad about things I've since learned, and only regret not "doing Tridion" sooner. 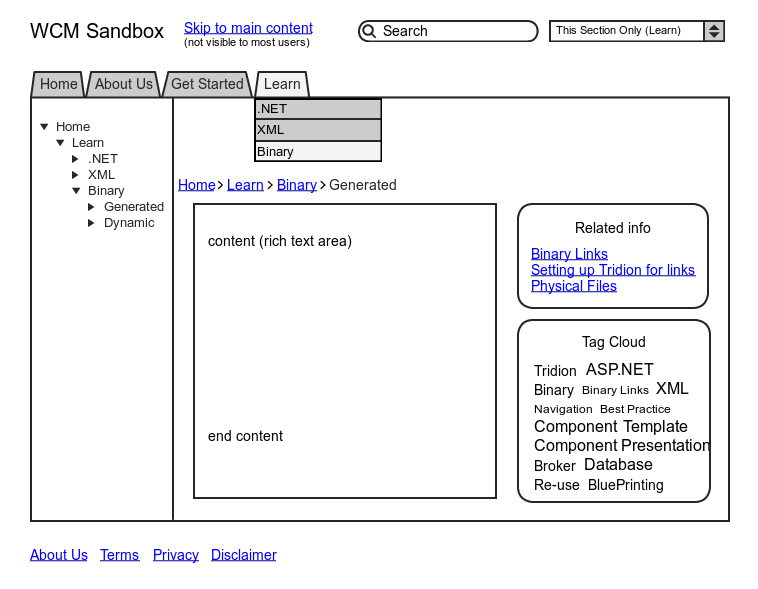 An SDL Tridion Sandbox Today? So how would such a proposal work today? I've seen plenty of of either custom training or sandbox environments among my colleagues, external Tridion practitioners, and at least one customer. However, I don't always see a formal proposal (or even documentation), but these simply might not be needed to get started when it's as easy as "right-clicking" to start a new cloud environment. Actually, I'd argue the opposite for certain setups. Sandboxes can be thrown away, but a plan is essential for more formal environments when it's as easy as "right-clicking" to start a new cloud environment. My colleague, Bart Koopman also asks if we need a get started guide for at Tridion templating.